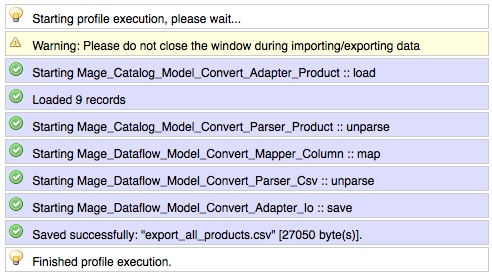 For export we need to login in Magento admin panel and move to System -> Import/Export -> Dataflow – Profiles. Next, let’s add an export profile and press button “Add New Profile”. You should see following panels, let's describe it one by one. Change profile setting as described in the table. Change profile settings as described in the table. Data transfer/Type Local or Remote server File could be uploaded from local or remove server by FTP. Need to provide required data like: filename, path, host, username, password e.t.c. Spreadsheet Name Name for sheet in XLS file. Leave blank to use the first spreadsheet. 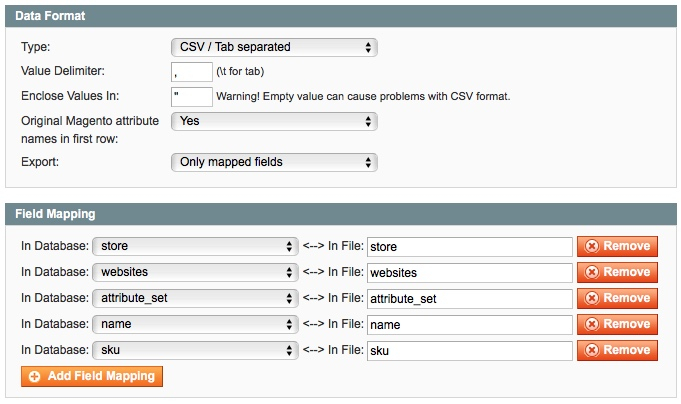 Export All Fields / Only mapped fields You can export all fields, but there are a lot of system fields in Magento that you don't need, so we suggest to export only mapped fields. Set up export filters to limit products export collection. Wait for the end of exporting. That’s all I hope it’s everything worked out. You can check exported file regarding in exported folder listed in “Menu File Information section”. 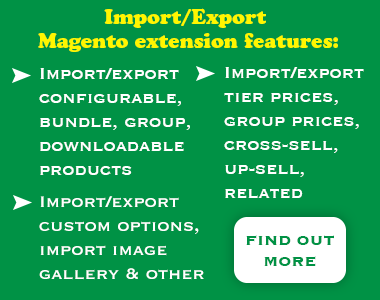 Magento does let you export configurable, bundle, group, downloadable products, you can check our paid extension for that purpose. Please click here to open the product page. Below there is a short video with the repetition of the setting up a export profile and exporting products.